Remember the old beer commercials where retired athletes argued the merits of "less filling" vs. "tastes great"? Sports car fans were caught up in a similar argument at the dawn of the new millennium, and the two Florida endurance classics at Daytona and Sebring found themselves in opposite sides of the argument. Should they opt for great cars – particularly the ones that compete annually in the 24 Hours of Le Mans – or concentrate on great competition? The split originally began in 1998, when Daytona International Speedway opted to go with a new sanctioning body for the Rolex 24 At Daytona, the USRRC. Sebring remained with Professional Sports Car Racing for the Mobil 1 Twelve Hours. For a year, it was a case of different sanctioning bodies using similar cars – in fact, the same Ferrari 333SP of Gianpiero Moretti, Didier Theys and Mauro Baldi (along with Arie Luyendyk at Daytona) won both classics in 1998. At the end of the year, though, new Road Atlanta owner Dr. Don Panoz held an event themed on capturing the flavor of the French endurance classic, a 1,000-mile race titled "Petit Le Mans." Pleased with the success of that event, Panoz shared his vision with the new owners of Professional Sports Car Racing, who opted to rename its full season the American Le Mans Series, using rules based on those of the Auto Club d'Oeust (ACO), used for the French event. Within a few years, Panoz purchased the organization and brought back the International Motor Sports Association (IMSA) to sanction the series. The move paid immediate dividends for Sebring. In 1999, a BMW V12 LMR driven by J.J. Lehto, Tom Kristensen and Jorg Muller won at Sebring – and a similar prototype won that year's Le Mans classic. This marked the first time since 1967 (when Mario Andretti and Bruce McLaren won in a Ford GT40 Mk IV) that the Sebring-winning model did not compete in the Rolex 24. It also began a streak that will come to a close with this year's Mobil 1 Twelve Hours of Sebring Fueled by Fresh From Florida on March 15. The following year – actually, the following six years – an Audi R8 drove to victory at Sebring, finishing 1-2 each time. . The Audi R8 gave way to the Audi R10 TDI in 2006, with Kristensen chalking up Sebring victory number five. That Audi repeated in 2007, with four-time winner Frank Biela joined by Marco Werber (three-time winner) and Emanuele Pirro (two victories). Audi's streak was snapped by Penske Racing in 1998, won by the Porsche RS Spyder of Timo Bernhard, Romain Dumas and Emmanuel Collard. Dyson Racing made it a 1-2 finish with Butch Leitzinger, Marino Franchitti and Andy Lally. Kristensen, Allan McNish and Dindo Capello returned Audi to victory lane in 2009 in an Audi R15 TDI, before Peugeot put together a two-year streak with the 908 HDI FAP in 2010-11. Kristensen and McNish returned Audi to the top of the podium in 2012 in an R18 TDI, while Oliver Jarvis was joined by Marcel Fassler and Benoit Treluyer in winning last year's race in an R18 e-tron Quattro. Daytona ran the Rolex 24 under USRRC sanction in 1998 and 1999, with that series folding only three races into the 1999 campaign. Putting together the pieces of the failed USRRC, Jim France (son of NASCAR founder Bill France Sr.) assembled a team of 25 investors to realize his vision of a new American sports car series. With goals of capping costs, maintaining close competition and returning racing to the fans, GRAND-AM Road Racing was formed. 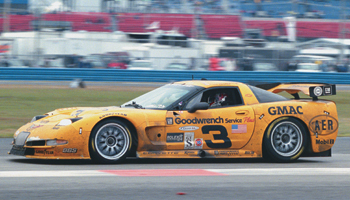 The GRAND-AM Rolex Sports Car Series debuted with the 2000 Rolex 24 At Daytona. While cars in the lead SRP class failed, a battle resulted between the GTS class factory-backed Dodge Viper and Corvette. The Viper prevailed by only 30 seconds – the closest finish in the history of the event at the time. The following year, Corvette won when the SRPs again failed. Ron Fellows. Johnny O'Connell, Chris Kneifel and Franck Freon drove the winning car and were joined in victory lane by the team's sister car – the third-place GTS Corvette of Dale Earnhardt and his son Dale Jr., along with Andy Pilgrim and Kelly Collins. Concerned with the lack of success of the lead class, France met with Brumos owner Bob Snodgrass and his associate, five-time Rolex 24 winner Hurley Haywood. Over dinner, they sketched a proposed race car, based on the Ford GT40 of the 1960s, that would be fast, safe and affordable. Fabcar's Dave Klym brought the idea to life, and the new Daytona Prototype was announced on the eve of the 2002 Rolex 24 as GRAND-AM's lead class beginning in 2003. Six DPs were on the grid for the 2003 Rolex 24 – including a Porsche-Fabcar for Haywood and JC France in the traditional Brumos colors. While the new cars had teething problems – a GT class Porsche fielded and co-driven by TRG's Kevin Bucker won overall – the DPs quickly gained traction. Only one year later, 17 DPs were on the grid. NASCAR Sprint Cup Series champion Tony Stewart held a three-lap lead with only 43 minutes remaining when he pitted with rear suspension problems. After his team made repairs to his Chevrolet-powered Crawford, Stewart returned with a one-lap lead. For a half-hour, it seemed that Stewart might be able to nurse the car home. But suddenly, with 17:45 remaining, the car suddenly veered right before the chicane, and his race was over. Defending DP champ Terry Borcheller was joined by Pilgrim, Christian Fittipaldi and car owner Forest Barber in the winning Bell Motorsports Doran-Pontiac. That set the tone of the racing at Daytona for the following nine races. Large DP fields with as many as 29 cars, with the series regulars joined by familiar names from NASCAR, IndyCar and international sports car racing – even Formula One. Chip Ganassi Racing with Felix Sabates won five of the events – four with sports car veteran Scott Pruett at the wheel. Brumos Racing scored a popular victory in 2009, when David Donohue held off Juan Pablo Montoya by .167 seconds in the closest contested finish of a major international 24-hour race. Haywood finished third in the team's sister car. Another milestone was the 50th Rolex 24, won by Michael Shank Racing with Ozz Negri, John Pew, AJ Allmendinger, and Justin Wilson. It was great racing – but missing some of the great cars and glamour of international competition. France and Panoz got together to discuss unifying North American Sports Car Racing, and shook hands on a merger in September 2012. Great cars or great racing? Like the Miller Lite commercials, sports car fans will now be able to enjoy both with the IMSA WeatherTech SportsCar Championship.